Some older articles that are still interesting. This was a popular story about spirits causing sickness on an island in the South Pacific. The events described were witnessed by the author. 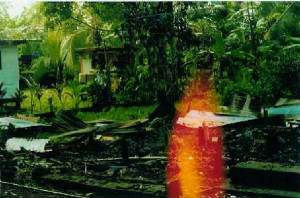 This photo was taken the day after a house was intentionally burned down -- the charred spot in the middle of the photo. The owner torched it to get rid of some troublesome ghosts who occupied the house and were making the neighbors sick. Photo was taken by the website author using an old Pentax 35mm film camera. What's the orange spot? I don't know. It's also on the negative. Christianity was brought to the islands of the South Pacific in the mid-1800s, but many of the indigenous beliefs survived. People still believe that spirits, called ‘aitu, still roam the islands. Some spirits have always been spirits, akin to nymphs and fairies, while others are the spirits of once-living persons. Both can either be obliging or troublesome, but the spirits of the deceased seem to be the most active. I arrived in the main village on the night of September 23, 2002. There was no one waiting at the airport to meet me because of a communication glitch, so I hailed a cab and instructed the driver to take me to a nice but not expensive motel. There was, at the time, only one functioning motel/hotel on the island, but I didn’t know that. My driver took me to the Rainmaker Hotel. The next day, I was talking with the head of the Commerce Department and the father of my friend Cecilia. He asked me where I had stayed that night and I told him. "How did you sleep?" he asked. "The phone in my room rang several times overnight," I said. "When I would answer it, there would be no one on the other end. It would ring through to the front desk." "The Rainmaker is notorious for its ‘aitu," he said. "Maybe the ‘aitu were saying hello." He told me a story from his childhood. Along the path that he and his friends took to get to and from school, there was one area they always hesitated to cross. When they got up the nerve, they would run as fast as they can, and usually they were pelted with a rain of small stones. "We always thought the place was the haunt of some ‘aitu," he said. ‘Aitu often choose a favorite resting place. It may be a tree or bush, or a building or pile of stones, but if anyone disturbs this place, the ‘aitu will throw stones at the offending person – or worse. Stories from the not-too-distant past tell of ‘aitu jumping on a person’s back and making them carry the spirit equestrian-style to another location. According to legend, the only way to rid oneself of such a spirit is to throw it in the fire. ‘Aitu are also feared because they can possess a person. Spirit possession here usually takes the form of a deceased relative temporarily inhabiting the body of and speaking through a young woman. The spirit most often is berating someone, including the person possessed, for an unacceptable behavior or for not taking care of the deceased’s grave. The ‘aitu are also blamed for causing unexplained sickness. The person "hit" by the spirit usually has done something to annoy the spirit, even though the action was innocent or even laudable. Spirits don’t like change, and if a person does something to change the ‘aitu’s favorite spot, that ‘aitu may retaliate. I currently live in Utulei village, two villages west of the main village on the island. My little dwelling sits on a hillside overlooking the harbor. The street next to the house meanders up the side of the mountain to the top – it’s a very steep climb. I walked to the top of the mountain one evening with some friends who are immigrants from another South Pacific island country. At the summit there is a little park overlooking the mouth of the harbor and the village of Utuilei. Turn the corner, and you can see the main village, the canneries and the main docks, and the other small villages surrounding the bay. The old cable car station is here, too. Years ago, the cable car took passengers from the top of the mountain, across the bay to the mountain on the other side. The cars haven’t run for many years, and the housing and cars are in decay. It’s a sad sight. The cable is still there, but the system is not operational. My Tongan friends commented about how beautiful the building must have been before it was abandoned and how much potential the location has for tourism. It was getting dark as we were enjoying the view. The sun had set, and the lights of the villages could be seen in the descending twilight. From within the bushes, I heard a little girl’s voice saying, "Boooooooo…. Boooooo…..!" "I hear an ‘aitu!" I said to my friend Soa, winking. "Boooooooo…. Boooooo…..!" whispered the voice, this time with a little giggle. "I’m scared," I said. "I hear an ‘aitu!" The ghost noises dissolved into girlish giggling and little Christina, age 4, ran down the sidewalk, pleased with herself that she had fooled the palagi. The house where I’m now staying is one of the oldest western-style houses in Utulei village. A Tongan man and his family are caretakers of the house, and they have lived there for about 30 years. The original owners are buried next to the house, under concrete slabs, the usual way for marking important graves on the island. I was sitting one day on the long concrete stairway that leads to the front door of this hillside house. A relative had driven up and everyone ran to greet him, leaving me alone to meditate quietly on the dark green fruit of orange tree growing in the front yard. I felt like someone was standing behind me, and when I turned, I could swear I saw a man in a brown suit standing at the top of the stairs, near the front door. It was only for an instant, then I was alone again. I mentioned it to Soa and he said it was probably the owner of the house, who is buried in one of the two graves. He asked me not to mention it so no one is frightened by it, but he said, "He’s probably watching over us." It reminded me of the ‘aitu who rang my phone my first night on the island, when I was staying at the Rainmaker Hotel. The Rainmaker is a short walk from the house: walk down the hill, across the high school campus, and right across the main road and you’re at the hotel. My friend Maria, who lives in Nu’uuli, also saw an ‘aitu. Maria’s experience was not a pleasant one, however. One evening, I was sitting in Maria’s living room with several native women. We were talking in their native language (which I only understand a few words of) and some English. It began to get late and I excused myself to go home. Maria offered to let me stay the night with them. I had a funny feeling – like an urgency to go home – so thanked her and said I was too bony in the wrong places to sleep on the floor (which made them all chuckle), and I went home. That night, the women said they heard a rain of softball-sized rocks on the corrugated metal roof of the house. When they ran outside, there was no one there. The guys who lived in the blue house next door were all asleep, as attested to by their snoring. Maria woke up in the middle of the night and to her shock and fright there was a man lying next to her, watching her sleep. He immediately disappeared, much like the man in the brown suit did when I looked at him. The day after the man’s "visit," Maria came down with an inexplicable, flu-like illness that dogged her for two weeks. It was disconcerting to see her walking around in 95-degree heat, wearing a t-shirt and a flannel shirt and whatever she could wrap around herself. She said she was freezing. The second week, I came home from work to see the blue house next door to Maria’s totally engulfed in flames. My friends were all standing around, some smiling, some looking serious but none looked worried. Two of the boys were carrying water to pour on Maria’s house to keep it from catching. I noticed, too, that the big old mango tree that grew at the front corner of Maria’s house had been given a serious "haircut;" most of its branches had been cut and it was just a trunk. The young man who owns the property was there, and I asked him what was going on. A traditional healer-clairvoyant had been called in about Maria’s illness, he told me. The healer did a card reading and told Maria that she had been "hit" by an ‘aitu who had come down the water pipe. The pipe originates in the mountains and runs across Nu’uuli, across the property, next to Maria’s house and down to the ocean. The healer (usually referred to as "the old man," which is not considered disrespectful; more like calling someone "grandfather") said the spirits were stopping over and living in the little blue house next door to Maria’s. They were mad at Maria because she has kept the property tidy and clean, changing things. Spirits apparently like things to remain unchanged. The Old Man recommended burning down the house and cutting down the mango tree. When Maria’s husband returned from the States, he would follow the pipe to its source, find the source of the spirits — usually a grave — and pour battery acid on them. He told me that, while his people pour boiling water on the graves of suspected wandering spirits (and often on victims of spirit possession), Maria’s people apparently have even less tolerance for troublemakers, so they use something industrial-strength: battery acid. The ashes of the house that was burned to get rid of spirits who were causing illness. EDITOR'S NOTE: This article is particularly interesting in light of the devastating tsunami in the Indian Ocean in December, 2004. There are a number of themes that recur in end times prophecy from many different centuries and from around the world. Some sources are Christian, some are not; some sources are religious, some are not. Here is a thought-provoking compilation of some of these recurring themes. They include tidal waves, earthquakes, volcanoes, comet, mind control, police state and various kinds of persecution. It is probably not a coincidence that people are dreaming about these things now. Many are reporting dreams depicting horrific scenarios that fit in with prophecy – in some cases, prophecies the dreamers were not aware of. As I write this, I don’t have access to a copy of Revelation. I will add that information as I can acquire it. Many people are dreaming of waves and water-related natural disasters. This theme can be found in the prophecies of saints and indigenous people, but Mary only mentions it at Bayside. This is the first "wave" dream. I was with a large group of people in some kind of structure. I was out on a porch or something, and I looked out to the sea and saw a huge tsunami heading right for us. It was coming fast! I ran inside to warn everyone, but only a handful listened to me. I ran to an interior room, and began packing a bag full of food and some other things I thought I might need. I felt the wave hit; it knocked me to the floor. Then it was over. I could hear people shouting and crying. I grabbed a coat and worked my way back toward the exterior. Someone was saying that the structure held up to the wave the way it was intended to, and expressed hope that it would survive whatever else was to come. It was then that I realized the structure was a ship of some kind, like a modern Noah's ark. We were aware that something bad was about to happen. We thought it was some kind of terrible disaster, like a global nuclear blast or something no one would survive. A wave was coming toward us that would have serious consequences. Some people gave up in despair, but many of us decided to try to survive. My friend and I, and a couple with a small child took some provisions and hid in a small cave under a rock. The next morning, we came out. I was surprised to see a large crowd of people gathering around a makeshift kitchen. I was hoping to fill my thermos with tea when a friend offered me a cup. Someone asked what had happened. A thin woman with strange eyes--eyes she kept downcast--said it was a temporal shift. I guess instead of being killed, we were shifted into another time, or our time changed somehow. However it happened, we had entered another era. I think in the former time zone, everything had been destroyed by the wave. Someone asked why we were preserved, and I said, "because of where we are, in this valley." I looked up toward the horizon, and noticed that we were in the four corners area, maybe on the Navajo reservation. There were mesas and rock formations that reminded me of the desert Southwest. It was a sacred place. I wondered: perhaps other sacred places were also preserved.